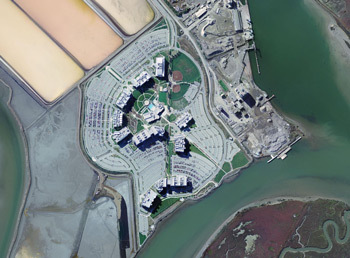 Redwood City's Pacific Shores Center is a 106 acre, 1.7 million square-foot office complex. Planned during the tech boom of the late 1990s, the project was not completed until 2001, after the technology bubble had burst. During the production of Account, much of the office space was still vacant. In the film, light passes though one building completely; having never been leased, it lacks interior walls. Consciously or not, the complex furnishes the abstract ideal of a 'new economy' with an emblematic, physical form: a real space to represent the intangible promise of globally exchanged knowledge, services, and capital. Heady optimism for cutting-edge technology, coexisting uneasily with aspirations to ecological sustainability, has resulted in an unlikely combination of flashy, aggressive architecture (perhaps inspired by monumental structures from science fiction) and ecologically-minded landscaping (native plantings, water conservation measures, and a nearby wetlands restoration project). The Pacific Shores Center was built on what was until recently a tidal marsh. 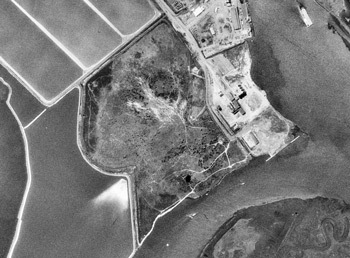 At the time of shooting, the adjacent land parcel was in the earliest stages of development. Construction machinery can be seen tilling the bay mud, likely introducing lime to harden it into a substrate capable of supporting buildings and roads—preparing a blank slate for the future.